So you've created a recipe or borrowed one from a soapmaking book, and you've made your first batch of soap. If you want to give it away, or even sell your soaps, you're going to need to learn about the various ways to ​package your soap. This​ cigar band label is a simple piece of cardstock with the name of the soap and ingredient information on it—and wrapped around the bar either horizontally or vertically. One advantage of cigar band labels is that they are easy to make, and can be printed simply at home. One disadvantage of cigar bands is shrinkage; even after you label it, the soap will continue to cure. When water evaporates out, the soap shrinks a bit. The shrink wrapping helps this quite a bit. If you want your soap to be completely protected from dirt, fingers, and scratches, shrink wrapping may be the way to go. 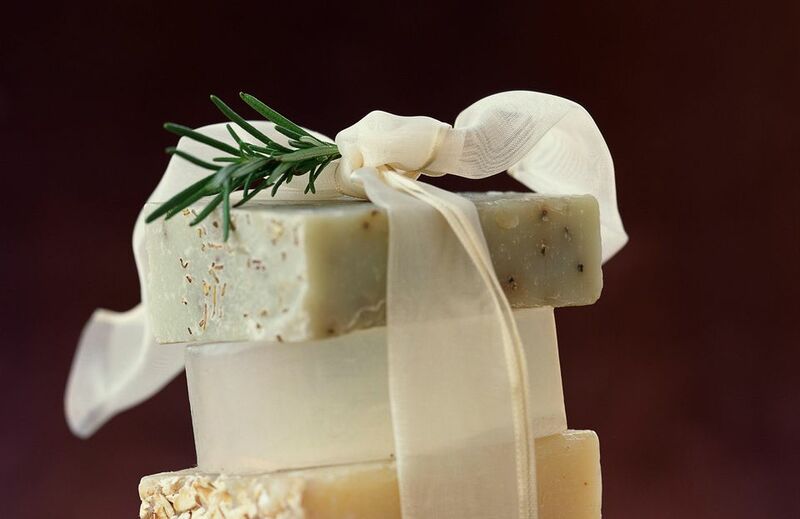 The advantage of shrink wrap is that it's a nice, clean, well-protected covering for your soap. The disadvantage is that unless you leave a part of the label open, you can't smell it. One easy way to package your soap is to drop it in an appropriately sized box. There are many companies that sell soap boxes, and, like the soap on the upper right, you can just add your own label and/or graphics to it. The box on the upper left is a custom box with a die cut cutout in it. It not only looks professional, but it gives a little window onto the soap so that you can see its color. That's the disadvantage of a soap box—not being able to see the soap that's inside it. The advantage is that it looks clean and finished and you have all the sides to put your text and information. Another option that I'm putting in the "box" category is the soap on the bottom. While not in a box, it's completely wrapped like a Christmas present with a label added. Those of you who make round soaps in PVC pipe molds have a different challenge - the shape of the soap. You can shrink wrap them, or use a coffee filter or a round piece of paper and wrap that around the soap. Then, place a label firmly over the edges of the paper. It's a simple, clean, nice-looking way to wrap round soaps. The "half box" is a combination of the cigar band and the full box that covers the soap on 5 sides with a box but leaves the top half open. The advantage is that the soap is well covered and stable (especially on its base) but still gives you a clear view of the soap and allows you to smell it. Sometimes a plain old soap wrapper just isn't enough. Here are some examples of specialty bags and boxes for soap. The soap on the left is in a mesh "scrubbie" bag; in the shower, it will have the same effect as a scrubbie embedded in the soap. Like felted soap, you never actually see the bar of soap inside. The bar on the right is a leaf-shaped molded soap in a very nice see-through fabric organza bag. Here you can see the flip side of the soap in the fabric organza bag and can see how they tucked the label in. The soap on the left is a felted soap, also in an organza bag. The soap on the right is a regular sized bar of soap in a special plastic box with a special custom medallion and label. Do I Need to Use Distilled Water In My Soap Recipes?